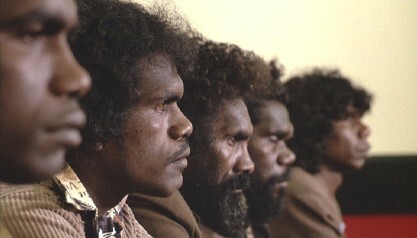 Gulpilil, the young aborigine star, is familiar to American audiences as the star of Nicolas Roeg’s Walkabout. How did you come to use him? It’s very difficult to tell you about Gulpilil. I know very little about the man. He’s enigmatic; he’s unique; he’s an actor, a dancer, a musician. He’s a tribal man, initiated in the tribal ways, found by Roeg at a very early age and put into an international movie. 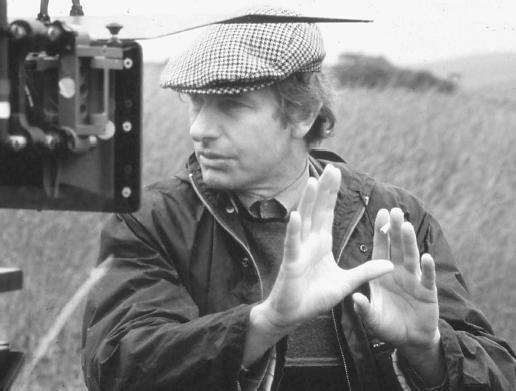 Roeg took him on publicity trips to Europe and the States. He has a foot in both cultures. It’s an enormous strain on the man. In movies sometimes you can draw on that. And my film is very much about… In his instance in the story, as one of the men accused of manslaughter, he is torn between two cultures. I didn’t get the performance out of himâ€”the situation did. The man is torn, and he has broken his tribal law by moving to the city, by marrying a black girl who is not tribal. He goes home, they still accept him in his tribal area, but he’s under enormous tension. It’s impossible to know what tension he’s under. He speaks English well and I talked with him. You can have a conversation about anything, music, and then suddenly he’ll have a moment, as I experienced. It was one of the things that got me on to the movie. He’ll say something in English that makes no sense. This is one of the things that drew me to write a part for him. I’d never written a part for a person. It’s dangerous: you might not be able to get the person. I’d used him in a TV episode in a very straightforward part. He was being persecuted by a white overseer in a historical series, and we were chatting in a bar one night after work, and he said some things about his family and then suddenly he said some English sentence. It was something like “You see my father and I and that’s why because the moon isn’t.” And I said, “What’s that meanâ€”your father and I and the moon isn’t?” And he repeated it. I said, “David, I don’t understand.” And he said it again. This was ridiculousâ€”we’d been talking. I said, “What are you talking about?” So he rearranged the sentence. It still made no sense. Well, I had to leave it, otherwise we couldn’t continue the conversation. And I thought about it that night and the next morning, and suddenly I realized what it was. That he was talking about another perception. He was talking about an experience for which there are no words. He’d seen something in another way. That was a breakthrough for me, firstly in my writing of the screenplay; and secondly in my future conversations with him, because then I would look out for these moments or I would provoke them. The problems are with the youth. We’ve got the sophisticated technology and so forthâ€”the transistors, music, the draw of the cities. So the problem for tribal people is how to bring their young people back into their culture, how to get them to be interested in initiation ceremonies, how to stop them drifting to the cities. It’s a case of how long they can continue to be tribal people in a sophisticated Western country. How did you find Nanjiwarra Amagula, who plays Charlie, and who is actually the leader of an aboriginal tribe? He’s actually a clan leader. He’d never made a film, nor will he make one again. Not because of my experience, but because he saw this as a one-time thing. He would do it for certain reasons. To get to him I had to go to, in Sydney, the Aboriginal Cultural Foundation director, a man called Lance Bennett, who subsequently became a friend. He was highly suspicious of a feature filmmaker delving into tribal cultural matters. It’s all very well to photograph a tribal man with spears against Ayres Rock, but another to delve into the system of perception, which I wanted to. So he screened me, he read my draft screenplay, and finally he passed me and he said, “OK. I’ll help you.” He said, “There’s only one man who can play your Charlie, one man who has enough wisdom, enough breadth, enough understanding, not just to come into the city but to make a feature film. It’s obviously a sophisticated Western process.” He said, “I’ll tell him about this on the radio-telephone on his island in the Gulf of Carpentariaâ€”Groote Island. He may or may not see you.” He did see me and we sat all day at Fanny Bay in Darwin, where he was rehearsing some dancers. Rehearsing dancersâ€”what does he do? As a tribal elder he’s a magistrate; he sits with a visiting European magistrate to try petty crime, which is what they cope with thereâ€”theft, drunkenness, etc. He speaks the language with the accused and he advises the European magistrate on sentencing. He officiates at tribal ceremonies, which are considerable. For instance, during filming he had to hurry home at one point to bury a child who couldn’t be buried until he was present. He’s a member of the Northern Lands Council, which is coping with the uranium question. He’s a very important, busy man. So a film is something that could have appeared frivolous. Our meeting, then. You know, they had no concept of acting. They don’t have acting. It’s the real thing. I sat with him on this beach and my first instinct was to tell him all about it. And I started to, and stopped because I could sense that it was the wrong thing to do and that he only wanted to do it his way. So we sat all day without saying a word. At the end of the day he said, “Can I bring my wife with me to make this film?” So he’d made the decision through that day in his own way, but it certainly wasn’t this idiotic language that we use. He sensed that it was right to do and that I was right to do it, I think. We then met that evening with Lance Bennett, who remained the go-between and who could speak the language. We discussed the concepts within the film and he asked me to place certain points within the film. Absolutely. It varied. With Gulpilil I had to be very careful of his ability to mimic a direction. He had considerable experience, far more than the others, and I could say to him … For example, the scene where he came to dinner with the old man, Charlie, and he walks up to the door and says, “Hi. This is Charlie.” Something simple. We rehearsed it and it was flat. I said, “David, what’s the matter, you’re not firing. What’s wrong?” He said, “What do you mean? What do you want me to do? I’m saying ‘Hi. This is Charlie. '” We had to act it out as a pantomime and destroy the language. I said, “This is a king you’re bringing, a man of great power. You’re bringing Nanjiwarra to the door. And when you say ‘Hi, this is Charlie,’ you don’t just mean that.” And I walked through it and we acted it out and touched each other. A great amount of touching, pushing, prodding, through other means of communication like that. And he suddenly said, “Oh! I see, I see! ‘Hi. This is Charlie.’ Let’s do a take.” Straightaway. And he just said the same line, the same movements, full of life. Language is secondary as communication. I don’t know if I wanted them to. I guess you could say yes. I didn’t say to them, “Please, I’ve only got an outline. Help me.” I wanted to approach them as equals, which is difficult to do with the white man’s burden and given the sad history of contact with these people. But I had to approach them and I used many ways. That was just one of them. It just arose. A series of connecting things, moments, that conversation with Gulpilil that I couldn’t understand. Something that happened before that. I’d had a premonition. I’d never had anything like that in my life. I don’t consider myself psychic. I was on a holiday in Tunisia; I’d come down from London. I’d always loved Roman or Greek ruinsâ€”not the way they used to be, I just liked the way they’d fallen down; but I kind of liked classical sculpture. We were driving to Duga, this inland city in Tunisia, Roman city, looks like Pompeii, and we stopped the car to exercise a little and everyone was picking up bits of marble by the roadside in the fields. The driver hit the horn and we were heading back to the car and I had this feeling, which lasted some seconds, that I was going to find something. I was picking up bits of stone and I saw on a stone three parallel lines and I picked that stone up. In fact it was a hand, a fist, and the lines were between fingers. It resisted a little bit, then burst up through this ploughed field and there was this head, the head of a child, broken off at the neck and at the wrist. It had been holding something on its head, or a sword or something. The nose was gone, the lips and so on, but I can’t tell you what that was like. I smuggled it out and took it home and had it dated and put it on my desk. I wondered about the head: why did I know I was going to find it? Subsequently I told people about it, and they’d say, “Oh, that happens to youâ€”it’s you.” And I thought, What if a lawyer had found itâ€”that’s more interesting. And at some stage from that I thought, What if a lawyer dreamt of some evidence, what if he found some evidence through a premonition? Someone trained to think precisely on the one hand; on the other, the facts, dreaming, dream some evidence. I told Gulpilil about this and we discussed things and gradually the forces began to come together. I did a lot of reading during that periodâ€”Casteneda and the Old Testament, strangely different influences; Thor Heyerdahl’s theories, Velikovskyâ€”and somehow these clues began to form a pattern. There was a new way to look at tribal people. Everything passed through the hands of the tribal aborigines we used. The Sydney people are deadâ€”white contact destroyed them. Around the city they’ve left signs and symbols, some paintings, carvings in national parks; they’re now protected. Nobody knows what they mean unless there’s obvious hunting in the picture. We took the Groote Island people to look at them. And Nanji just said, “Poor fellows.” So therefore, we created a fictional situation. The only thing was, Nanji insisted that there are still the Sydney people there, but they’re spirits and their spirits exist at sacred sites and protect sacred sites, so if there’s a sacred site under Sydney he said, “This is true, your script is true. The spirits will be there, therefore I cannot be human.” That was one change because in my story Charlie was human, initially. He pointed out that that was impossible. But he could be a spirit that took on human form; this is quite possible. In The Last Wave a white man seeks ritual assistance from a black. Was it your intention to show that whites can learn from blacks if they take the trouble? I don’t think so. You can’t come in contact with them. I paid a million dollars to spend six weeks with them, when it gets down to it. Who could do that? They’re in the North, a long way away. There are a few books, but I haven’t been lucky enough to find anything interesting. They’re either academic on the one hand or quasi-poetic on the other, and I didn’t set out to preach in the film. But something to think about, something I think about a lot, is the fact that I, with a basically Scottish-Irish-English background, have lost my past. I have no past. I’m nobody. I ask my parents who these people are in the photograph album and they can’t remember. Nobody knows. I have no culture. I’m a European who lives in Australia. I’m an Australian in a sense, but I’ve lost something. And that’s what I made a film about. Part of the film seems to be about the white man’s guilt over the destruction of the aboriginal culture. It’s part of the story but by no means the most significant. The loss of dream time on our side is much more interesting. It’s a system of perception. I first learned about it as if it were some kind of mythology. Like Grimm’s fairy tales: a collection of aboriginal dream time legends: how the rivers were formed, where the sun came from. In fact, I didn’t like anything I read. They always seemed cute in English, or coy. “The great great bull was in the sky and he hit the wombat on the head and that’s how the sun came.” I just didn’t like it. It was only when I talked to tribal people, not only about that but about other things, that an idea of dream time, as a way of perceiving, as another perception, started to come to me. The dream time wasn’t something in the past, but was a continuing thing. It is, in fact, another time, and people of great power can step into it and step back into our time. Now, how or what that means, I only touched on. I suppose I’ve been shaving some mornings and I’ve watched that water coming out of the tap and I’ve thought, It seems to be under control. What if I couldn’t turn it off, and no plumber could ? We think we’ve got nature under control. Disasters always happen in Third World countries; in my part of the world we’re OK because we’ve organized things. We wouldn’t permit a cyclone to hit the city…. It seems to me we’ve lost touch with the fear of nature. More than the respect for it, because there are too many poems written about the respect for nature. To be absolutely dead scared. Tonight, when we leave this building and there’s a special kind of wind blowing. If that wind is howling with a voice like the voice of a person, a four-year-old child might say to us, “The wind’s talking to us,” and we’ll say, “No it isn’t. Don’t be silly. It’s just howling around those wires.” Organize his imagination: everything’s under control. It’s just part of something that we’ve lost touch with, another way of seeing the world. It was part of a balance of things, a balance within us, and we’ve eliminated it since the Industrial Revolution and it’s forcing its way back. People make movies about it, write books about it. Often they’re junk. Children are born with it, with this balance. We teach it out, but it’ll find its way back with some of us. It’s a common dream amongst all peoples throughout all time. The water rising up, the last high tide. It’s mentioned in the Bible, which is a type of journalism. It’s happened before; people have chosen to forget it. It’s the Velikovsky collective amnesia, which is used to forget certain catastrophes. We, 40,000,000 of us, live hard along the coasts. We’re mostly in the cities on the edge of this vast continent. It’s just there to be seen if you live there. It affects you even if you’re not conscious of itâ€”that great emptiness. You can travel and see nature as it was before the history of man, and you can be days driving from a hamburger joint or something. It doesn’t take any imagination at all to feel awed. You’ve been quoted as saying, “It takes only the littlest thing to reveal the chaos underneath.” What chaos is there under Richard Chamberlain’s suburban life? It seems happy and tranquil. Things not thought through, things suppressed. The natural forces that have been cemented over and the bloodstains of the corpse are seeping through for some people. It’s there and we just don’t choose to see it. 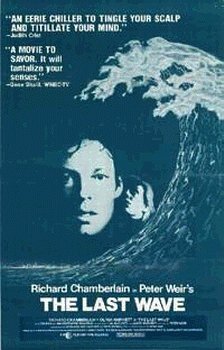 Richard Chamberlain learns of a previous civilization that was destroyed by a great wave. He was part of that civilization. Are we meant to believe that he was an aborigine in a previous life, or that he is psychically in tune with the aborigines and that’s why he’s chosen to be their lawyer? Here we have two men: one white, one black; one tribal aboriginal, one highly sophisticated Western civilized man. Both fine men. One of them has material wealth; one has spiritual wealth. I wanted my lawyer, with his material wealth, with his humanitarian principles, to, firstly, glimpse with his mind that there was another lost dream, or spiritual life, and then to touch it. I thought, How can he touch it? I’ll have him go back down, go back downâ€”that’s what I kept saying in my mind. How can he go back down? I thought, Go back down underneath the city, down through the sewer, through the filth, down to the dirt, down to his own lost spiritual lifeâ€”treated with some logic, some realistic elements. It’s not a fantasy. I wanted to represent it that way. So he goes back down, and there, within the ground belowâ€”we’ve mentioned in the film that his background is South American, he came from South America as a childâ€”and there he touches his own lost spiritual life, his own dreaming. In a sense he’s given a gift by the aborigines. There are symbols and signs from some other life, or South American historyâ€”who knows what? He can’t cope with it. He can’t handle that kind of knowledge. I don’t think he could. Picnic at Hanging Rock, your previous film, is about the mysteriousâ€”and historically realâ€”disappearance of three girls and a teacher during a school picnic in 1900. While not overtly occult, it is mysterious: two of the girls and the teacher are never found, all the watches stop at noon, and so forth. What is the significance of the red cloud that Edith says she saw? Something that was always a pattern of geological disturbances. A lot of things were written about, or collected by Charles Ford, who wrote a book about phenomena around the world from the last century and early in this century. Red clouds were consistently represented in reports from Peru and elsewhere, coinciding with other mysterious happenings, showers of stones, etc. For me, this unsolved mystery … Nor is the story necessarily true. This is one of the most intriguing things. The author of the book [Joan Lindsay] from which the film is taken says it may be true. Strange thing to say. She wrote the book in her sixties. She’s no publicist; she’s a very shy, aristocratic, interesting woman. When I met her the agent warned me not to ask about the truth of the matterâ€”which I did immediately. She said, “Never ask me again.” When the film was released and there was massive press contact with her, she asked, “Should I tell them?” I said, ‘Keep your secret. It’s not the point.” People disappear all the time. There are no newspaper records, but that doesn’t mean it isn’t true. For me it was partly to do with natural phenomena. In The Last Wave and Picnic at Hanging Rock you’re concerned with the occult and the mysterious. Is your first feature, The Cars That Ate Paris, similarly concerned with the occult and the mysterious? I don’t think those things are occult and mysteriousâ€”I think they’re natural. When people ask me why I always make films about the occult, I say … I don’t mean to be clever about it butâ€”maybe it makes me eccentricâ€”I think these things were natural. Maybe they’re not now, but we’ve only chosen to see the world in a certain way; it’s by common agreement these things are so. It’s why we laugh at foreign tribes who paint their noses red, or something. They laugh at us because we wear sunglasses. It’s what we all agree upon. It seems a reasonable thing to say we’ve agreed on the world, but it also therefore seems reasonable to say that it’s not necessarily that way. As for The Cars That Ate Paris, it was retitled The Cars That Ate People in the States, and for anyone in the Carolinas who was unfortunate enough to see this recut version of that first film, well, it was a grotesque monster of a film. It was an allegory using the B picture formâ€”hence the title, which was like The Monster That Ate New York, or whatever. It was about a bunch of kids who had cars. They were living in a town [in Australia, not France] that lived off motorcar accidents: they trapped cars by night. Eventually the young Frankensteins rose up and decorated their cars one night with mouths and sharks’ teeth, and they attacked the town. But the allegorical element was eliminated the way the U.S. distributor cut it, and the picture came out as senseless violence. It was a horrible film. What would you like audiences to know about your films? I remember a quote of Bruce Springsteen’s in Rolling Stone. He said, “I like to give audiences something money can’t buy.” So I’d like them to walk out with much more than the $4.00 or whatever it cost.